The Michael O’Brian Band have recorded a cover of Barry’s song “Potty Training.” The band consists of Michael Zerbee and Brian Anderson. They have been performing together since 1976 and have been singing their own version of Barry’s song “I Wanna Be a Dog” to adult audiences for many years. The grown-ups seem to love the song as much as the kids do. 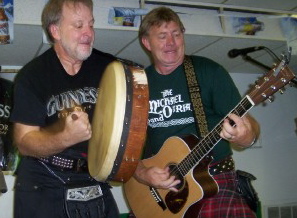 Michael plays guitar and Brian performs on flute, penny whistle and Bodhran.